What Peter Cook would call 'the biscuit boys' have been busy at South Kilburn Estate: but the biscuits in the variety tin are of distinctly variable quality. Brent Council has made Herculean efforts on this really difficult estate regeneration to 'get it right'. They are partnering with a number of Housing Associations. They are keeping their architects in at least a consultative role all the way through the various schemes. And they have chosen some solid and interesting architects to work with at that. So far so good. But LB Brent, as master promoter, needed to wield a bigger stick and to take more risk. Their role and opportunity as landowner on such a huge piece of contiguous estate is such an important one, where they can and must demand the very best quality for their residents and those of the future. The recent award-winning terraces by LDS and ABA are well executed, which I can only put down to their delivery by the careful Catalyst HA. Other phases led by Network and L&Q are far less successful, showing every sign of having been victims of unsupervised Design and Build procurement where the 'design-focused' architects were abandoned as soon as planning had been rubber stamped. Indeed, one phase has scaffolding up only three years after completion. This is a perennial problem with UK housing delivery, and one on which I continue to make several personal crusades, including slideshows showing terrible detailing to local authority development managers. Saving a bit of money by wheeling in hack 'executive' architects is the worst possible false economy, which impoverishes the streetscape for generations. And it is a crime where this is the 'second go' at getting it right, at making a better and more thoughtful investment than was achieved in the 1960s. The landscape is the place where Brent's investment in the present and future does show through. The front gardens of ABA's terrace have been lushly planted at the outset - lavender is a good way of masking the bin store's inevitable smell and small sett thresholds provide an intimate welcome mat to each property. Parks have been carefully inserted into the masterplan to allow new and existing buildings to breathe and 'meet each other'. Mature trees, both new and existing, provide welcome anchors, as do ubiquitous benches which, a resident assured me, did not attract any anti-social behaviour. Cars are banished to their own courts which is a compromise, but at least leaves gardens free to be just that. The only mis-step for me is the back gardens on the LDS phase which intrude into what would have been an amazing communal garden. There must have been something unsayable about standard 'social housing' garden sizes and tenure mixing here which caused this silly barrier to occur. 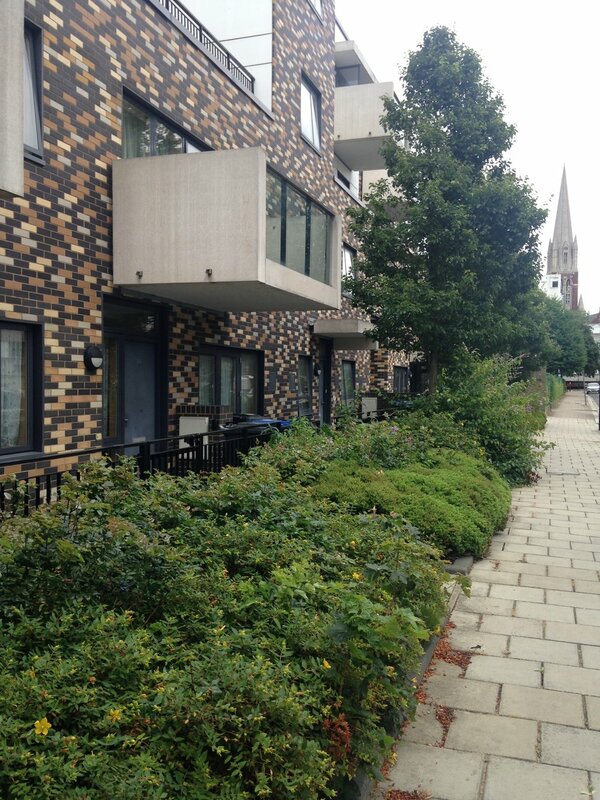 I also visited an earlier phase whose variegated brickwork and concrete canopies already looked very tired and unkempt. The proud 'Building For Life' Silver plaque made me think: 'Building For Life' is all very well, but 'Management For Life' is just as important. Can we give awards for that too?